The really big news here is that we have a new kitten. Claudia discovered it running wild where she works - it had been out there on its own for at least 3 weeks. She asked a local Cat’s Home to let her use their humane trap to catch it - and then we brought it home. That was just over 2 weeks ago. As a feral kitten, it was quite wild and frightened, but it is gradually coming around to us and getting more adventurous every day. We haven’t been to the vet yet, but Claudia is pretty sure it’s a boy. If so, we’re giving it the full name of Maximilian de Winter - but we’ll be calling him Maxim or Max for short. (Maxim de Winter is a character out of a really famous old book called Rebecca - some of you may know the movie?) 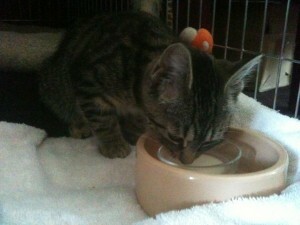 For more pictures of the kitten, check out the Facebook page via the link on the right side of the Home Page here. Other news - the two big summer giveaway competitions are now over. I’ve been running one here and Arya has been running another on mysticrealms.co.nr. All the winners are in and many signed books have already been sent out - but if you took part in Arya’s competition and haven’t yet sent in your address, you should do that soon so I can sign your book and send it off. Winners include: Christina from Farmington, Valerie from Salida, Sarah from Saratoga Springs, Autumn from Hawaii, Kayla from Tuscon, Laura from Ontario, Brittany from Manitoba, Celine from St Charles, Megan from West Seneca, Maddie from Beverley Hills, Alexandra from South Bend, Dawnmarie from Grand Island, Cheyenne from Culver, Ashely from Woodstock and Ingrid from Champaign. If you have not yet received your book, you should get it soon. Other news is that the first The Six Crowns book “Trundle’s Quest” is now out in the USA in paperback, and that the 2nd book in the series, “Fair Wind To Widdershins” is due out any day now in Hardback. To find out more about this great adventure series, check out www.thesixcrowns.com. Book two of Destiny’s Path is out in the UK and Canada and Australia and New Zealand: Destiny’s Path: Govannon of the Wood. Remember, this is virtually the same book as book 2 of the Warrior Princess series, with a change of title and a few very minor edits. I’m still working on the brand new adventure series for boys (mostly) which will start coming out in the UK next summer. It’s called Codename Quicksilver and is a series of 6 books (so far) about a 14 year old orphan boy from London, England, who becomes a spy for the British Secret Services. Apart from that, I am working on something new with an illustrator pal of mine, Gary Chalk. Here’s an early picture from the planned book series. 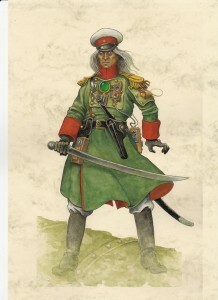 It’s an evil Russian Vampire soldier - one of the hero’s worst enemies! Let me know what you think. 6 COMMENTS ON Competitions & Kittens etc. Your cat’s soooo cute!!!! That’s neat that you rescued it! I think that the Russian Vampire Soldier is really creepy! I wouldn’t ever want to meet one of them! The mostly boy series sounds kind of intresting. I just finished the “Charmed Return,” and it was AMAZING!!! When I thought that xxxxx had died, I almost started crying!!! The ending was… PERFECT! Oh, I wish the series wasn’t over! AFJ. Lauren - thanks so much for the praise! It’s very much appreciated! I edited your comment a little, just for people who have not read the book yet - don’t want any spoilers here. Soooooo cute! I absolutly loooovvvveee cats <3! I love all your books sooo much. Your the best writer I’v come across in a while. Please keep writing.